Koontz is an incredible author, Dabel Brothers is a great company – sounds like a winner to me! 10/13 – Dabel Brothers Publishing proudly presents the newest project in collaboration with New York Times Bestselling Author Dean Koontz: Fear Nothing Volume 1! Fear Nothing tells the story of 28-year-old oddball hero Christopher Snow, who lives in the city of Moonlight Bay, California, along with his hyper-intelligent dog Orson, his best surfing buddy Bobby and his late-night deejay girlfriend Sasha. Snow has XP—xeroderma pigmentosum—a very rare genetic affliction that forces him to avoid light at all costs, and will likely give him cancer later in life. His parents died under mysterious circumstances and he’s now being stalked by the shadowy characters who want Snow to stop trying to find out how they died–or else they’ll bump off his remaining loved ones. “This is a well-written and beautifully drawn adaptation. I’m delighted with it,” says Dean Koontz. The novel is adapted to comics by writers Grant Alter and Derek Ruiz, with artwork by the talented Robert Gill. The book will be a 128pg full color soft cover trade paperback, retailing at $14.99 USD, with a ship date of December 15, 2009. Fear Nothing is the first Koontz project that the Dabel Brothers decided to forego serializing first as a comic book series before publishing as an original graphic novel. The Fear Nothing novel has sold over 2.5 million copies in the U.S. alone since its release. It features all the pulse pounding thriller action and great character development Koontz fans have come to expect from his work, as well as a bit of comedy, and yes, even an army of evil mutant rhesus monkeys! 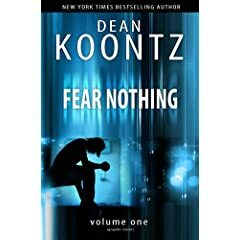 Look for Dean Koontz’ Fear Nothing Vol. 1, a $14.99 full color SC TPB, in stores everywhere Dec 15th!